After graduating from the Applied Mathematics and Physics Course, approximately 80% of the graduates go on to a master's course of the graduate school (Department of Applied Mathematics and Physics, Department of Applied Analysis and Complex Dynamical Systems, and Department of Systems Science of the Graduate School of Informatics of Kyoto University). For details on options after graduation, access the website of each department. 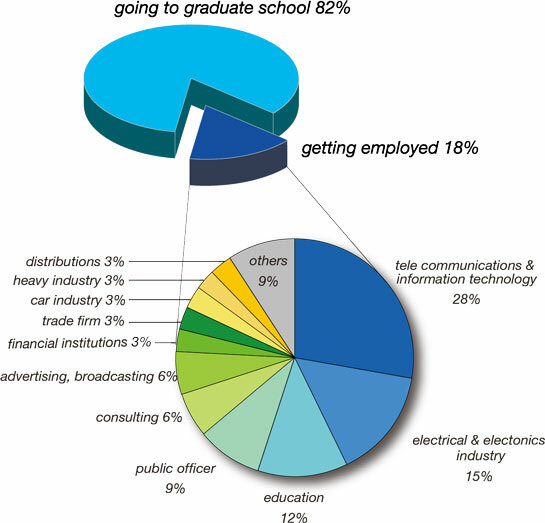 Because of the interdisciplinary nature of the Applied Mathematics and Physics, graduate students are hardly limited in selecting their place of employment. The Course annually produces excellent top-class personnel for various types of industry. It might be true that students of this Course have a greater leeway in selection of a place of employment.